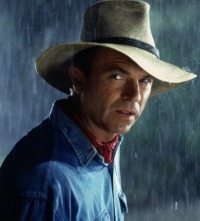 Dr. Alan Grant is a central character in the first and third Jurassic Park films. Grant is a well-known paleontologist who is invited along to Jurassic Park by billionaire John Hammond to take a tour of the park and endorse it. He specializes in hadrosaur and other duck-billed dinosaurs such as Maiasaura. In the original Jurassic Park novel, Alan Grant is described as “mid-thirties, a ragged-looking guy with intense concentration you wouldn’t want to get in the way of.” and he has a fondness for children. The character is based on paleontologist Jack Horner who served as a consultant on the Jurassic Park films. In the novel, Grant tells the two children that he once had a wife who died years ago but this was never mentioned in any of the films. In the original novel, a lot of time is spent on Grant and the children exploring the island, trying to find their way back to the group. Most of this is absent from the film, which only covers a few events. 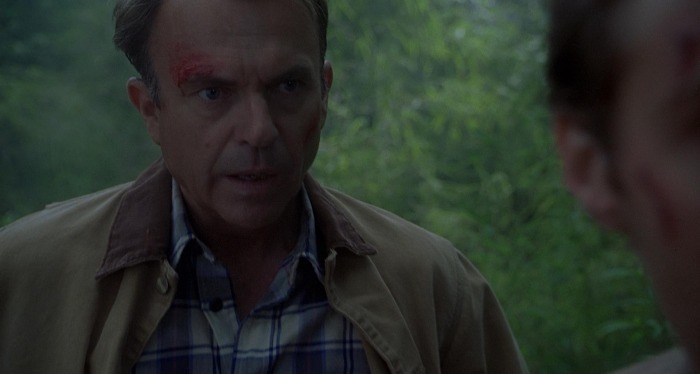 In the films, Alan Grant is portrayed by actor Sam Neill. He has a different personality to the character in the novels. In the movies, he possesses more of a introvert personality and doesn’t like children but as the events unfold, he warms to Tim and Lex. Director Steven Spielberg made this change as he wanted some dramatic tension in the film that the novel didn’t have. He has similar personality traits to Indiana Jones, like wearing his iconic cowboy style hat. In Jurassic Park, Dr. Grant specializes in Velociraptors, and believes that birds are related to dinosaurs. He is first seen at working at a dig site just outside of Snakewater, Montana. Eccentric billionaire John Hammond meets with him and invites him to a tour of the Jurassic Park theme park on Isla Nublar. After Hammond offers to fund their dig for another three years, he and his partner Ellie Sattler go there and is captivated when he sees live dinosaurs for the first time. Hammond takes him to the laboratory where Grants learns about how they were able to clone the dinosaurs and he watches as a baby velociraptor hatches. Things take a turn for the worse when power is cut to the park. The Tyrannosaurus Rex escapes the paddock and Grant rescues the kids and escapes. They narrowly miss being hit by a Ford Explorer, run through a herd of Gallimimus and climb over an electric fence. They make it to the Visitor Center and are attacked by three Velociraptors. John Hammond eventually picks them up and Grant says he won’t be endorsing his park. They get in the helicopter and leave the island. Alan Grant only makes a minor appearance in The Lost World. He is seen giving a talk and proposes a theory that the Tyrannosaurus rex could not live in rainy climates, disregarding the rumours of InGen cloning dinosaurs as absurd. 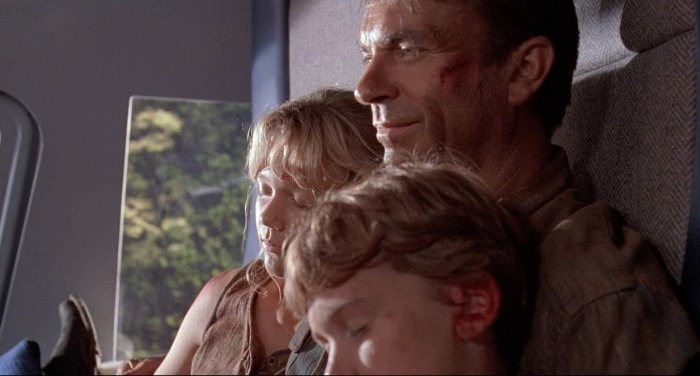 Alan Grant returns as a central character in Jurassic Park 3. Since the events in Jurassic Park, Grant has continued his work in the paleontology field and still very much specializes in velociraptors. He claims that they are more intelligent that they ever thought possible. He is seen giving a lecture about them but his audience is only interested in hearing about Jurassic Park or the San Diego incident. Grant says that nothing could make him to Isla Sorna. He is then seen working at a dig site near Fort Peck Lake, Montana and he no longer works with Ellie and has a new colleague called Billy Brennan. He agrees to take a tour of Isla Sorna after a allegedly wealthy couple (Paul and Amanda Kirby) offers to fund his dig site. They fly to Isla Sorna and land the plane despite Grant’s protests. Grant discovers that the Kirbys aren’t wealthy or married and they are in fact searching for their son who disappeared near the island eight weeks ago. Their plane is destroyed by a Spinosaurus and they become stranded on the island. He learns he was right about his theories about raptor intelligence and their advanced communication abilities. By the end of the film, he escapes the island with the help of Ellie Sattler. According to the Jurassic Park movies, Alan Grant has written two books. The first one, Dinosaur Detectives, was referenced by Tim Murphy in Jurassic Park and he carries a copy of it around with him. The book was written by Alan Grant and Michael Backes and it had a foreword by Richard Attenborough, who played John Hammond. In Jurassic Park 3, Eric Kirby mentions that Grant wrote a book about the Isla Nublar incident. Eric says he got the impression that he doesn’t like dinosaurs very much after writing this book.